2. Go to the PRIVACY tab and choose a visibility option according to your needs. Anyone - This option permits anyone to see your publication. Anyone with the link - Anyone who has the link can access it, but please note that if you share the link of your publication in a website or a social network, your publication will be included in the Search Engines index, but if you want to exclude it from this index you need to activate this option. Get more information about excluding your publication from the Search Engines index. Only People I Choose - This option permits access to people with explicitly granted permission only. Only People With Password - This option permits access to people with the password only. 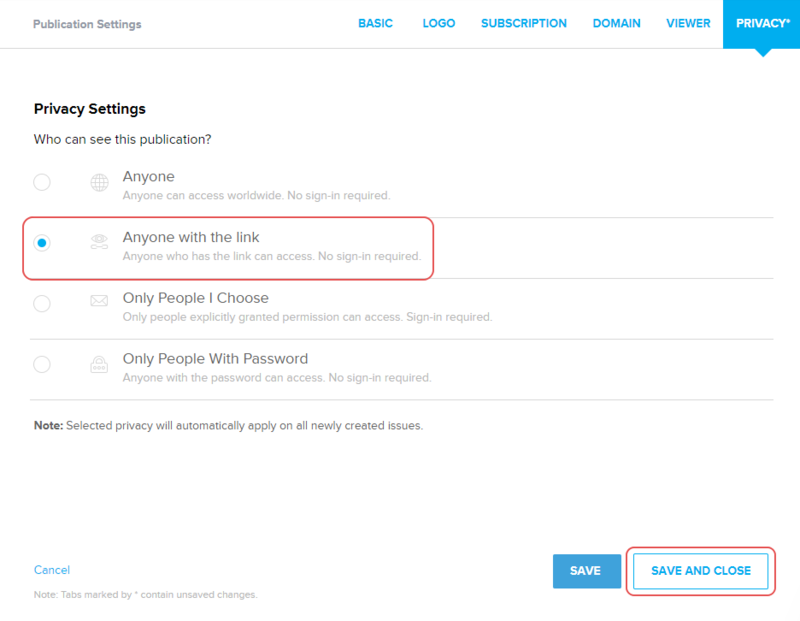 Note: All newly created issues will be set with the selected privacy level by default. However, you can change the privacy level of the issues anytime you wish. Learn more about changing the privacy level of the issue.